In the present research an attempt was made to study the relationship between loneliness and quality of life among old aged people. In this study purposive sampling technique was used to collect the sample of 80 old aged people in the age group of 65 to 75 years old (40 were old age home people & 40 were living with family) from Haridwar. Data is collected by using UCLA Loneliness Scale and WHO-quality of life scale. Mean and standard deviation of loneliness of people living in old age home (42.33, 8.51) and people living with their family is (34.10,6.81) and t- value is 4.78. This shows significant difference in the level of loneliness of old age people living with their family and old age home. Mean and standard deviation of quality of life of people living in old age home (58.33, 8.62) and peopleliving with their family is (92.88,13.24) and t-value is 13.83. This shows significant difference in the level of quality of life of old age people living with their family and old age home. The level of loneliness is high in the old age people living in old age home. The level of quality of life is low in the old age people living in old age home. Loneliness, Quality of Life, Old Age People. Bergeron, L.R. (2001). An elderly abuse case study: Case gives stress or domestic ioQncQ. Journal ofGerontogical Social Work, 34(3),41-63. Bhasin, H. (2016). Comperative study of family pathology based on old age habitants and family habitants. The International Journal of Indian Psychology, 3(4), 67. ISSN2348-5396(e), ISSN2349-3429(p),DIP: 18.01.189/20160304,ISBN: 978-1365-39397-6. Bhat, K. (2001). Ageing in India: Drifting international relations, challenges and option. Cambridge Journal Online, 21,621-640. Cacioppo, J.T., Bemtson, G.G., & Decety, J. (2010). Social neuroscience and its relation to social psychology.Social Cognition, 28, 675-684. Coyle, C. E., & Dugan, E. (2012). Social isolation, loneliness and health among older adults. Journal of Aging and Health, 24, 1346-1363. doi:10.1177/0898264 312460275. Dandekar,K. (1993). The elderly in India. New Delhi: Sage publishers. Gowri, G.B. (2003). Attitudes towards old age and ageing as shown by humor. Gerontologist, 77(2), 220-226. Green, B.H., Copeland, J.R., Dewey, M.E., Shamra, V., Saunders, P.A., Davidson, I.A., Sullivan, C., & William, C. (1992). Risk factors for depression in elderly people: A prospective study. ActaPsychiatricaScandinavica, 86(3), 213-217. Hansson, R.O., Jones, W.H., Carpenter, B.N., & Remondet, J.H. (198687). Loneliness and adjustment to old age. International Journal of Aging and Human Development, 24(1), 41-53. Jahan, M., & Khan, S. (2014). Psychological well-being: Spirituality and successful aging. 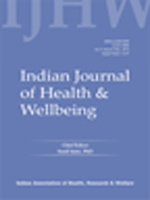 Indian Journal ofHealth and Well-Being, 5, 843-846. Mary, V.A. (2014). Loneliness, depression and sociability in old age. Indian Journal of CurrentResearch (IJCR) (Quarterlyintemational Journal), 1, Issue3. ISSN: 2347 9213. Patterson, A.C., & Veenstra, G. (2010). Loneliness and risk of mortality: A longitudinal investigation in Alameda country, California. Social Science and Medicine, 77(1), 181-186. Russell, D., Peplau, L. A., & Ferguson, M. L. (1978). Developing a measure of XonQlinQss. Journal of Personality Assessment, 42, 290-294. Shankar, A., McMunn, A., Banks, J., & Steptoe, A. (2011). Loneliness, social isolation, and behavioral and biological health indicators in older adults. IHealth Psychology, 30,377-385. doi:10.1037/a0022826. Sithara, B.V.,&Devi, V. G. (2015). Quality oflife of the elderly in Thiruvananthapuram district,'K.QTaa. Indian Journal of Gerontology, 29(3), 331-346. Steptoe, A., Shankar, A., Demakakos, P., & Wardle, J. (2013). Social isolation, loneliness and all-cause mortality in older men and women. Proceedings of the NationalAcademy of Science of the USA, 779(15), 5797-5801.